Archbishop McCarrick has said he has "no recollection" of the alleged abuse. Further allegations have since emerged. Archbishop McCarrick was one of the most prominent US cardinals and is one of the most high-profile Catholic leaders to face abuse claims. In a statement, the Vatican said Pope Francis had accepted Theodore McCarrick's resignation from the cardinalate and had ordered his suspension from the exercise of any public ministry. Archbishop McCarrick's resignation from the cardinalate is the first since 1927, when Father Louis Billot resigned because of political tensions with the Holy See, according to the New York Times newspaper. Archbishop McCarrick is alleged to have assaulted the teenager while working as a priest in New York in the early 1970s. The claims were made public in June by the current Archbishop of New York, Cardinal Timothy Dolan. At the time, Mr Archbishop McCarrick said in a statement that had "no recollection of this reported abuse" and believed in his innocence. 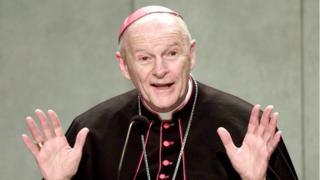 Archbishop McCarrick has not commented on the more recent allegations. It has also since emerged that financial settlements were reached in at least two cases of alleged sexual misconduct with adults involving Archbishop McCarrick.